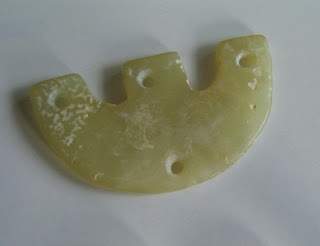 This 3 prong jade ornament was purchased in China. 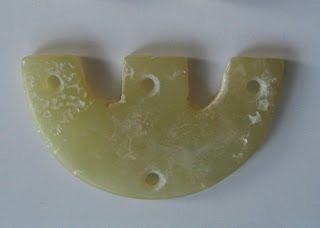 It is an archaic shape and resembles the trident shaped artifacts from Neolithic periods which has been described as "San Zi" (shaped like the Chinese character "Mountain." ) Such artifacts are illustrated and described in Chinese as well as Western literature. 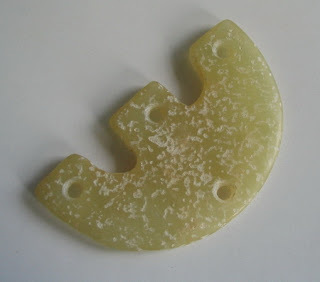 See JADE by consultant editor Roger Keverne pages 54 and 76 for Liangzhu examples. 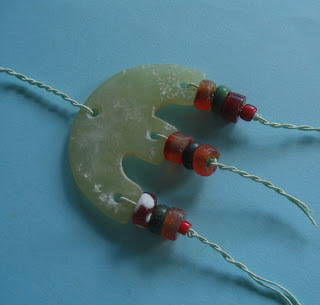 They are said to be hair ornaments because they have been discovered near the head usually together with a jade Stick. 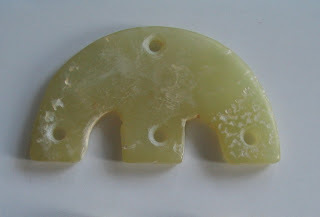 The Liangzhu examples in book JADE show exquisite carvings but my specimen is completely plain. The holes are also positioned differently, the Liangzhu trident has holes drilled from the top of the prongs, while in my specimen the 3 holes on the prongs and one at the circular end of the pendant are all drilled through the body of the pendant. My pendant is also thinner than the Liangzhu ones. On the obverse side the damage is not so bad. 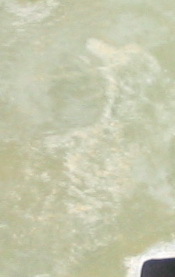 Do you see a sillouhuette or vague outline that is birdlike and seems nature made? Ha ha mayhap my imagination doth run wild (the cynic Heng says its just a blotch lah !) I just love these quirky pieces that will not make me rich except in the mind and the heart. To conclude, this three prong piece strongly resembles an archaic artefact though I'd be hard pressed to give its definite vintage. Ornament for Johnny Depp or Stone Age Guy ?